Summer is coming up soon! Will your feet be ready? 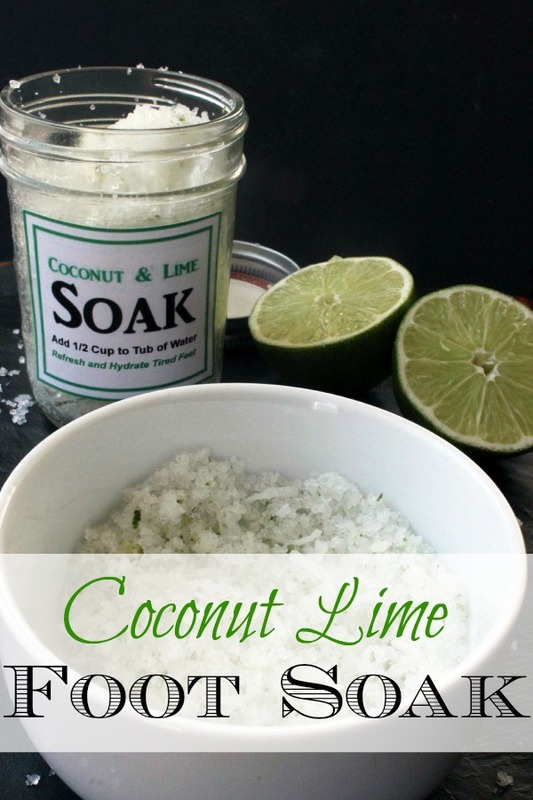 If your feet haven’t seen the light of day for a few months now, now is the time to get them ready, and this Coconut Lime foot soak is the perfect way to do it. With sweet tropical ingredients including coconut oil, shredded coconut, lime and lime essential oil, one whiff of this delightful foot soak is all it will take for you to think you’ve been transported into paradise already. Do you have any birthdays or special events coming up soon? 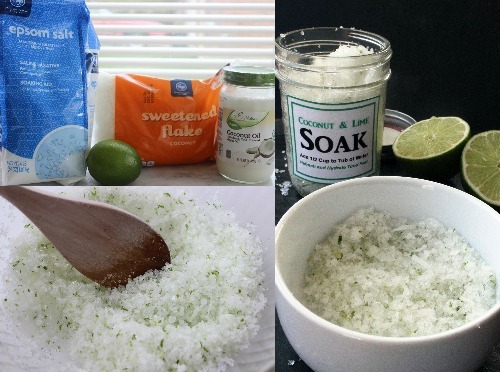 This Coconut Lime foot soak is an awesome gift idea, whether you are celebrating a birthday or a wedding shower, or you simply need a sweet hostess or thank you gift. All you need is a pretty jar and a label, and you have a thoughtful, yet inexpensive, gift to share. You could even make several jars in advance so you always have an emergency gift on hand. Plus, this homemade foot scrub couldn’t be easier to make. Simply mix all of the ingredients together, place in a pretty jar and you’re done! You’ll probably want to make a large batch, though, because this is one homemade foot scrub you’ll want to treat yourself with time and time again! We have created this printable label for you so it will make it super easy to print out and make this special gift for your loved one. You can print out on plain paper and tape to your jar or you can use full sheet labels to stick onto the jar. Transfer to decorative jar, seal and attach label. I am just learning about essential oils. Thanks for this recipe. This will make a great Christmas gift this year. Thanks for sharing this on the #HomeMattersParty and hope you will come back and link up again next week. awesome thanks for this ! Hi, Briana ~ I’m visiting from the Something to Talk About Link Party. I love to pamper my feet, and I love to give handmade gifts, so this post was perfect for me! I could smell the lime as I read your post, and I’m excited to make a batch of this asap! Thanks for sharing. Have a great week!